In an article posted yesterday, by the Canadian newspaper the Globe and Mail, it was laid out that Western donors are giving less toward the most recent world tragedy than they have toward other world catastrophic events. The reason? 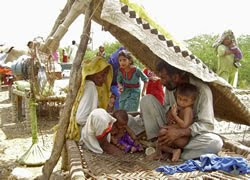 The most recent catastrophe occurred in Pakistan. It seems that one week after launching fund-raising efforts to help the victims of Pakistan’s recent devastating floods, a coalition of Canadian charities raised only $200,000 for the region. While some might say that this is a substantial fund-raising effort, it pales in comparison to a week after the tragedy of January’s Haiti an earthquake, when more than $3.5-million had been raised in the same time period. More glaring proof can probably be found in the fact that I can't recall having seen a single television commercial here in the U.S. about the floods. When the earthquake occurred in Haiti, you couldn't watch television for more than 10 minutes without seeing at least 3 commercials detailing how you could help. Text message donations were made available, where one could donate $10 by merely texting the word "Haiti" to a certain number. But for Pakistan, not even a commercial with a mere mention of a group, that one could look up, if one were even interested in helping. If you are interested, I've just discovered you can donate $10 to Pakistan flood relief by texting "SWAT" to 50555. Or, you can check out Save the Children, which is coordinating relief efforts. Or, if you prefer UNICEF is also sponsoring fund-raising relief efforts. And quite possibly the most offensive part of all this business are the comment's left on the article published by the Globe and Mail. How people can find derogatory things to say and reasons not to donate to needy children is absolutely beyond me. People are people, regardless of where they are hurting, and you can bet that the people who make decisions to start or continue wars, are not the same people who are starving and homeless due to this tragedy. That's like stating that one should not have helped Katrina victims because Americans stick their nose in everyone's business. Great information. It is sad to see that we live in a high-tech world but thinking wise still very low and immature. hi there! nice blog u got.. Thanks Mae. These ppl really need help.